We are a group of artists who create many types of art for a wide variety of clients. The ImageWorks FX began life as the art and design work of Joseph Lester. It continued to grow from there, as other artists joined the team. We have also created many works with our collaborators at Creature Distortions. See the Bio page for more background on some of our artists. 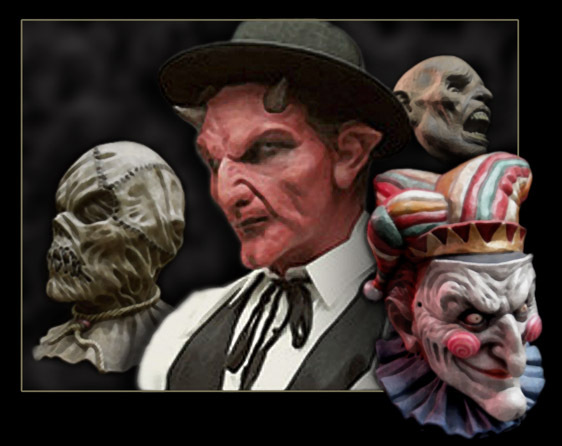 We have created work for films, stage plays, photo shoots, live events, prototype sculptures for use in mass production, as well as mask and prop designs for major mask companies. This is in addition to creating original characters for numerous haunted house attractions and other events. We also do body-painting and face-painting for public and private events, using the flesh as an ever changing canvas. Please take an opportunity to view some of the past work we have done in the Galleries section. Keep in mind, this is not everything we have done; simply a sampling. Feel free to contact us about how we may be able to bring your dreams, visions, (and sometimes nightmares) to life. We can create work along the entire spectrum of styles, from strict realism to extreme theatricality, and from beauty to horror.